What is unique about Depth Coaching? There is much wisdom in the eclectic nature of coaching. Our emphasis is on the maturing and development of our clients. Psychologist Carl Jung had a term for this maturing process—individuation—and it is particularly important in our approach to coaching to customize any approach toward the individual and his or her unique history, thinking style and situation. How the neural networks of the neo-cortical and the other less accessible/less directed parts of the brain need to be integrated if real change is going to happen. Professionals, leaders, people in general tend to get in their own way with old habits and thought, many of which helped them at some point but which are now in the way of progressing into the current situation. Depth Coaching provides creative ways to address these old habits—also known as complexes–keeping what is useful, or updating them as needed, or replacing them with new and a wider range of options. The first and second half of life (not defined by age in a linear fashion, but by maturity tied to experience and aptitude) have different rules for achievement and accomplishment. In a culture focused on youthful attributes, the wisdom that is possible in the second half is the root of mature leadership and good team and personal relationships. Carl Jung was the first to work on the second half of life development. The need to have meaning and make a difference are two of our deepest human motives. the calls to leadership and authentic living are neither fuzzy concepts for un-scientific thinkers, or sole domain of the faith-centric among us. Vocation and the quest for meaning are central to human effectiveness. The sense of being called to use your unique talents and live and work out of a sense of values and purpose are both requirements for happiness and formulate important life-long inquiries. Leaders facilitate this inquiry for themselves and others through value-based decisions that align the practices of the organization with worthwhile and worthy work. Coaching in general has benefits built-in—it builds over time so change is not only started, it is sustained. Depth coaching takes this several steps farther. It goes to foundational thought levels, the thoughts behind the thoughts, so that real change can happen. Real and lasting results occur because the whole context was considered and better, implementable decisions are made. It is whole-brained, incorporates the type of person and learner the client is, not only discovers but works with the way the clients thinking and emotional/social intelligence gifts and limits operate. 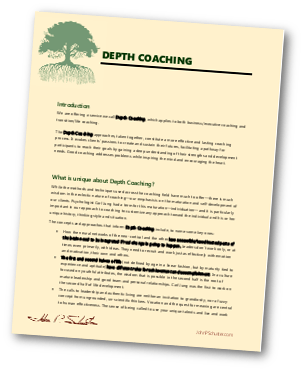 Depth coaching goes for quick results whenever and wherever possible and goes beneath the surface solutions that often fall short in the long run. There is a science behind depth coaching based on the neuro-sciences. But there is a mystery in coaching co-creativity that makes it an art form as well. We have applied the science of emotional intelligence, cognitive and affective neuro-science to help tap greater potential for our clients and their organizations for years. The magic of the moment, the breakthroughs that come with coaching, are not predictable, nor should they be. 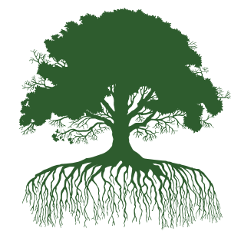 Depth coaching is a boost to support people as they live the unknowns in the adventure of their work and their lives. A whole person, whole-brain approach is the best way to give yourself (or your managers if you are the source for coaches in your work setting) your best shot to make wise decisions and reach positive, balanced-view outcomes. With Depth Coaching leaders develop more fully as communicators, motivators, and team-builders, matching the outer and systemic changes needed in the organization to the inner development of the leader. Major change for anyone, rarely easy, becomes more possible. Leaders don’t work only, or at times even primarily, with ideas. They need to recruit and work just as effectively with emotion and motivation, their own and others. This article “Therapy, Depth Psychology and Executive Coaching” describes how coaching and therapy overlap and blend. You can scan it in a few minutes, or try to absorb it deeply and spend some time. Hope you find some value.